This recipe serves 8 and is made in an 8 x 8 pan. 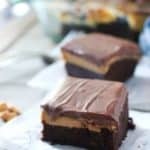 Delicious chocolate cake topped with peanut butter straight from the jar and topped with an easy frosting you make you make in the microwave! Preheat oven to 350 degrees and prepare ganache frosting. Pour chocolate chips in large microwave save bowl and microwave for one minute until just soft. In another microwave safe bowl heat cream until it just begins to simmer around the edges. About 2 minutes. Pour hot cream over chocolate chips and let sit for 2-3 minutes. Using a wire whisk, mix well. Chocolate will melt and will become a creamy consistency. Be patient, it takes a bit of stirring. Add vanilla. Cool in fridge for while cake is baking to thicken the ganache. Spray an 8 x 8 pan with non stick spray. Add flour, baking soda, baking powder and salt. Mix until combined. Bake for about 35-40 minutes, or until a toothpick inserted in the center comes out clean. Completely cool cake. Spread peanut butter on top with a spatula. Chill cake in refrigerator until peanut butter is firm to the touch, about 15 minutes. Chill 30-60 minutes, slice and serve!